So you want to become a guest contributor at Forbes. You want the glory, fame, and resume perks that come with that regal distinction. I totally get it. First, though, before getting into the whole how to, I’d like to be very straight with you about what it means to be a Forbes contributor. The fact is that it’s a great thing for a writer, but only a specific kind of writer. What Does Being a Forbes Contributor Look Like? 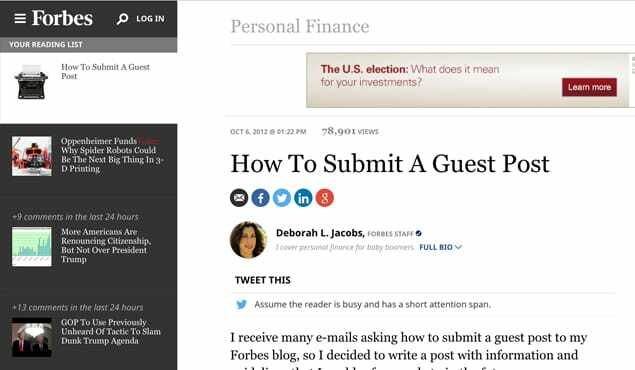 The Guest Contributor role at Forbes may not be what you think it is. Yes, you publish regularly on Forbes. Yes, you get the general power that comes with the website’s SEO positioning, social media followers, and reputation. Yes, you sound like a semi-successful person at cocktail parties. 1. You don’t get paid. Guest contributors don’t get paid by Forbes. All the writing you do is done by you, pro-bono. Or, if you want to look at this way, it’s done in exchange for those perks mentioned above. Whether or not it’s important to get paid for your writing is not for me to say. The line is very fine when you get the exposure of a major website, but in general I value money and my time, so I try to find places where I do get paid to write. If you’re looking to pay the rent, the Forbes Guest Contributor shouldn’t be your most immediate concern. However, if you’re playing the long game and can afford an article a week, by all means. Note that this is completely separate from Forbes’ on staff writers and bloggers. These people are paid, often at different rates and with different incentives. 2. You publish once a week. This can vary a bit depending on your arrangement, but in general Forbes guest contributors are required to publish once a week. That’s one article per week that you don’t get paid for. Make sure you love writing, and have the time, because the only thing an editor will be sure to notice is if you don’t get your articles in on time. 3. You get little help. The Forbes model is a hands-off experience. Typically you get the “OK” to write, and then you write on your own. 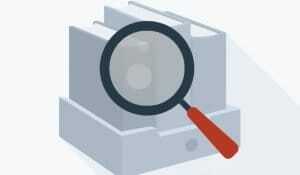 Topics are often up to you, as is the writing, uploading to WordPress, editing, image finding, and publishing. The whole process, basically. This is excellent for people who love to write and really want the exposure, but can seem like a strange environment for up and comers. If the truth above doesn’t phase you then you’re already on the road to Forbes guest contributor status. Below I’ll get into the major elements you need to even be considered for a guest contributor role. I’ll also highlight some key, simple things you can do to increase your chances. 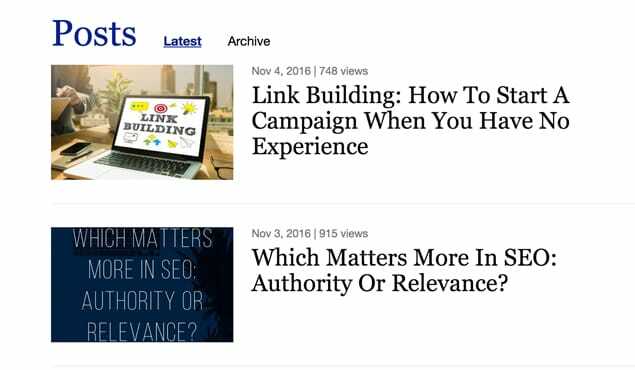 The first and most important of getting picked up as a guest contributor for Forbes is having online, published experience. You don’t need to be on a bunch of well-known websites (I’ll get into this more below), but you do need a lot of content online. This can and should mean your own blog. Forbes doesn’t just want words from you, they want your audience to come along, too. This means you have to have an audience. In the process of approval, the backlog of content will serve as a reference for your existence in the online sphere. Starting a blog a month before you try and get the contributor role and having four blogs posts up is just not going to cut it. Forbes wants to see you have a dedication to writing that greatly precedes their involvement because they need to know you can write for a long period of time. On deadline. With consistent voice. You represent their brand when you write for them, so they will only take on people that have proved they can do this for a good amount of time. With the backlog of content, keep in mind that Forbes has a pretty specific area of interest when it comes to readers. These include personal finance, stock market, business, technology, and occasionally lifestyle. There is room for other things, but if you’re a Guest Contributor that produces an article a week it’s likely you’ll need to be squarely in one of these topics. 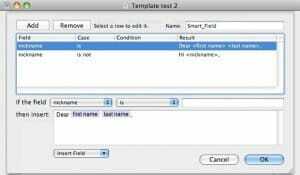 The editor will expect you to write in them, too, so your backlog of content should show that you are an expert in a given field and can produce topics in that field regularly. This is a little nugget of wisdom not often mentioned when it comes to Forbes — they actually don’t want you to be published on all the major blogs. If Forbes had its way, they would only bring on excellent writers with wide audiences garnered from their original blog. The writers would not have a presence on other websites, and therefore would be known for writing on Forbes and Forbes alone. Part of the Guest Contributor role at Forbes (and many other publications like it) is that Forbes wants people to come to Forbes to read a specific writer. If that writer is on Business Insider, Mashable, Inc, and Entrepreneur as well, it creates less of a focused drive to visit Forbes. 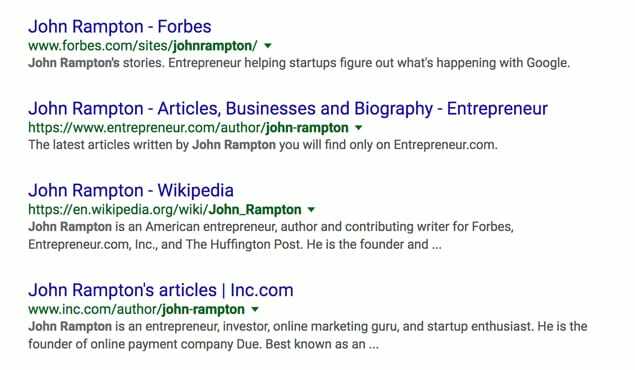 If you’re a well known author at all of these places you could still write for Forbes, but if you’re at that level you won’t be needing this article. 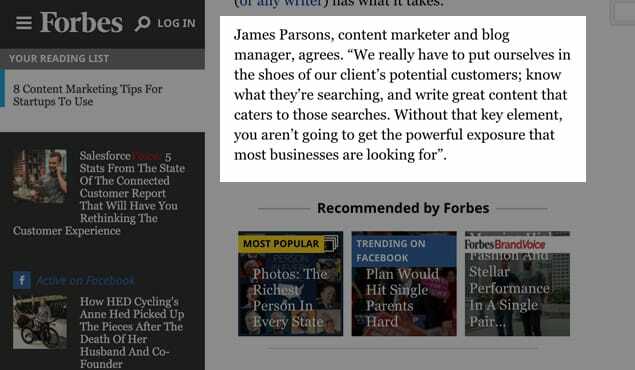 Another major element that’s helpful in getting selected as guest contributor on Forbes is actually being quoted in Forbes. That’s how much of a splash you should be making in one of the topics mentioned above. If you’re a tech writer with a blog and a large readership, you might have been interviewed by a Forbes writer at some point. Or a Forbes writer has quoted an article of yours. Both of these are excellent ways to make quick introductions to the editorial team. Nothing says “I’m one of you” like emailing them with a friendly reminder that you’ve been quoted in specific articles, and therefore would be a legitimate author on their website. When it comes to actually getting the guest contributor position, there’s nothing like friends on the inside. Not only is this a great way to get quoted in Forbes, but it’s an excellent showing of faith when someone who is already a contributor recommends or approves you for the position. Forbes is not “looking” for writers, but it’s also not refusing writers. If the right writer comes along, and the timing works out, you can get in there. Having a guest contributor on the inside will get your name to the top of a list, and then it’s just a matter of having the right content to fill the spot. If you’re lucky you already know a contributor. However, most of you don’t. The best way to get on their radar is to read their posts on Forbes regularly. Then go to their personal blogs or other sites. Be well read of their work and then start commenting on all of it. Become a recognizable name to them. After doing this for a while you can shoot an email or comment with a link to an article you wrote, which should be of similar topic and somehow relevant to what’s going on, and start a dialogue with them. Writers are people, and by nature and profession want to learn things from other writers. Make yourself a writer to learn from and you’ll be able to connect with a current guest contributor at Forbes, which will pave the way to your future there. With those large concepts in mind, you can also approach the situation on a smaller, more direct level. You can always do these things, and they just might work. However, without the larger background of publications as a writer, a connection, and quotes, it will be hard for you to get through. The simplest way to try and become a guest contributor is to use the Google Doc form Forbes created for this very purpose. It’s very simple. 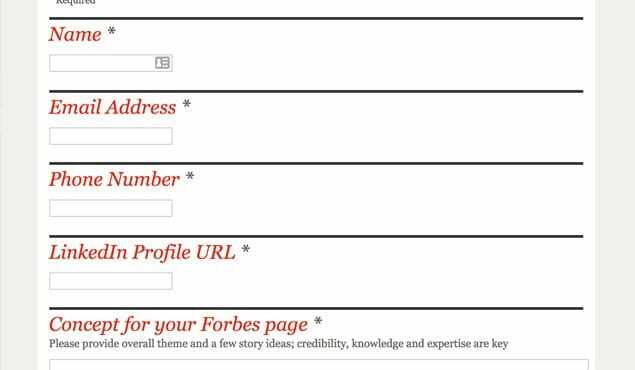 Go there, fill out your name, website, expertise, your “page” concept for Forbes, and provide examples of work. It’s like a personalized shot in the dark, and who knows, it could work for you. I wouldn’t bet on it though, unless or until Forbes has a massive need for writers. Which it currently does not. You can try to get a Guest Contributor spot on Forbes by first being published in their Opinion section. You can submit to this through the opinion@forbes.com email address as well. In short, you can submit an article of any length that expresses your opinion about topics covered on Forbes. It will be reviewed within 5 business days. If you don’t hear back, you didn’t get selected. Also, they ask that you not email again to check in. So, another shot in the dark. This process is very open, but in general you’ll want to submit a complete article with a fully articulated opinion on a given subject. As with all guest posts, make sure your opinion is unique and topical, incredibly well written, and references your expertise on the subject. If you can get an opinion piece published you’ll have an easier time pitching for the guest contributor position. If you don’t want to simply befriend an author or editor from afar, but directly reach out to them with a pitch, you can. It’s not the first course of action I recommend, but if a nerve has struck you and you must email the person to get published, you can. As far as talking to editors goes, a lot of it is about timing and luck. Reach out to them through their author profile, or see if you can hunt down their email address. Just make sure your first email counts, and triple-check it before you click send. With the above in mind, you need to continue to try. If being a guest contributor at Forbes is a legitimate goal of yours, all the legwork you do to write there will snowball. The longer you write your blog the more content you have to apply with. The more often you submit an opinion piece the more likely it is you’ll get published in addition to your name being more recognizable. The longer you track writers on Forbes, the quicker you’ll make friends of them, and have an easier in. Keep trying, Forbes guest contributor hopeful. You’ll get there!